In Janaury 2013 Samsung announced the first OLED TV from their Real OLED TV series, the 55" F9500. Samsung calls these Real OLEDs to emphasis the direct-emission OLED architecture. Direct Emission OLEDs use red, green and blue subpixels - without any color filters. This is opposed to LG's WRGB (or WOLED-CF) OLED TVs that use white OLEDs with color filters. 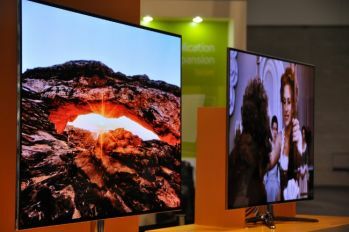 Samsung claimed that Real OLEDs offer better picture quality and are also more efficient than other designs. The disadvantage of this architecture is that it is more difficult to produce such OLEDs because the smaller OLED sub-pixels require precise patterning. Samsung announced the F9500, but never actually released it. In August 2013 Samsung did launch an OLED TV, the KN55S9C - but it never used the Real OLED TV name. Samsung stopped producing and marketing the S9C OLED TVs soon afterwards, and is currently focused on quantum-dot enhanced LCDs. Some reports suggest that Samsung does plan to start producing OLED TVs soon, but the company itself says it has no plans to do so in the near future.